Originated from a small food stall in 1956, chilli crab became the famous Singapore’s dish that all visitors want to enjoy. In 1956, Cher Yam Tian and her husband Lim Choo Ngee began selling crab cakes cooked with tomato sauce, then flavored the dish by adding chili sauce. They sell in a cart beside the Kallang River. The business went well and the crab cooked with chili sauce became popular, which enabled them to open a Palm Beach restaurant. The first version of chilli crab was fresh crab cooked with tomato sauce, chili sauce and French bread. The name is chili crab but this dish is not too spicy. CNN listed it as the 35th best food in the world in 2011. Dragon Phoenix restaurant owner, also a famous chef, did a great creativity when addingsome new factor to the original chili sauce. He used sambal chilli sauce, tomato sauce and eggs instead of chilli and bottled tomatoes. This recipe is becoming more popular, applicable to most chili crab today that tourists enjoy in Singapore. The chili sauce in this dish is described as "full of excitement" and "sweet, salty" with an eye-catching appearance. Mud crab is the most popular crab to make this dish, but other types of crab can be processed in the same way. The traditional way to enjoy this dish is to use your hands to eat, feel the taste of crab meat with sweet spicy sauce. Diners will feel the appeal of the dish on the table when enjoying the meat which sinking into sauce. 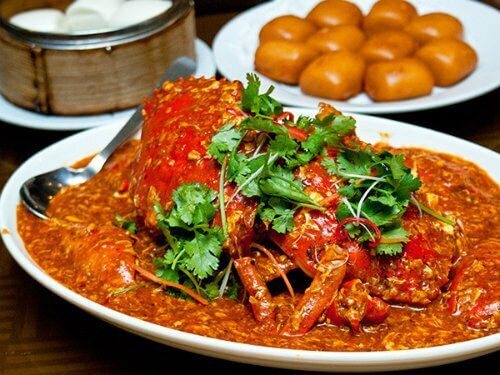 Chilli crab is served with fried dumplings or steamed mantou with chili sauce, tomatoes and eggs. The restaurant always provides wet paper or a bowl of water and lemon for guests to wash their hands after eating. Chilli sauce has been selected by the Tourism Authority of Singapore as one of the national dishes that tourists can find at any seafood restaurant in the Lion Island. However, the best chilli crab destinations you should try are Long Beach Seafood Restaurant, No Sign Boad, Jumbo, Red House, or Mellben.